Boost Your Revenue with Consultation Services. Auditing for E/M Consultation Services has been confusing auditors for years. In January 2010 CMS took a stance by no longer reimbursing providers for CPT consultation codes (99241 -99245 and 99251 – 99255). Since then many organizations have given up entirely on billing for consultation services. Unfortunately, by giving up you could be under-billing services or leaving money on the table. 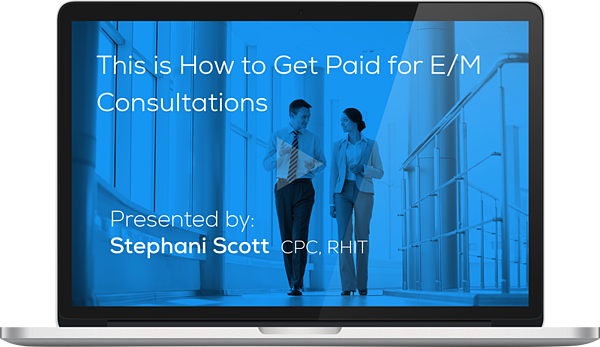 In my upcoming webinar, you’ll learn how your organization can continue to report and get paid for consultation services. This program meets AAPC guidelines for 1.0 CEU. It can be split between Core A and all specialties with the exception of CIRCC. On-Demand views require successful completion of post-test for continuing education units. You will receive your CEU in a separate email after watching the on-demand recording.